But man, that is one jumbled cover. The profusion of floating heads and colors and what’s going on with the Thing’s chest (oh, it’s another body) and what the heck they’re lying on, which I’m still not sure about (a trampoline? with chains?)…. It took me a minute of study just to figure out what’s going on there, and not in a good way of wanting to see all the details. 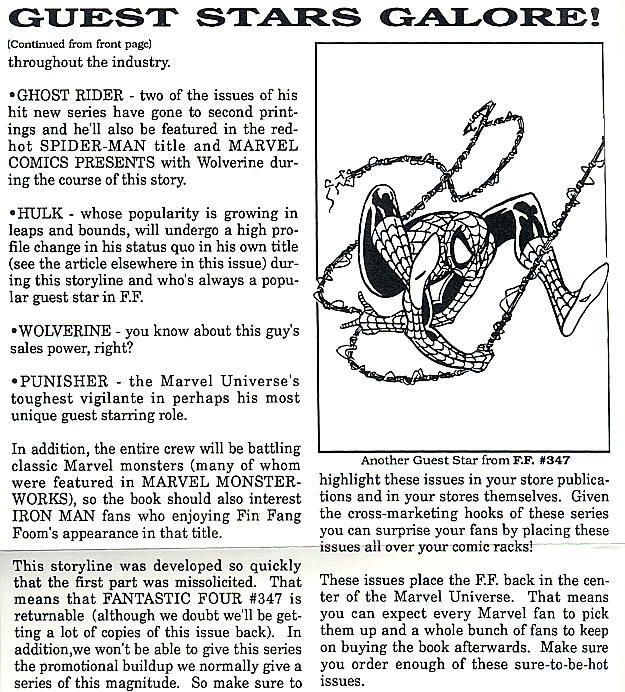 This is back when I was buying Fantastic Four from the newsstand at the grocery store. This arc was very exciting. 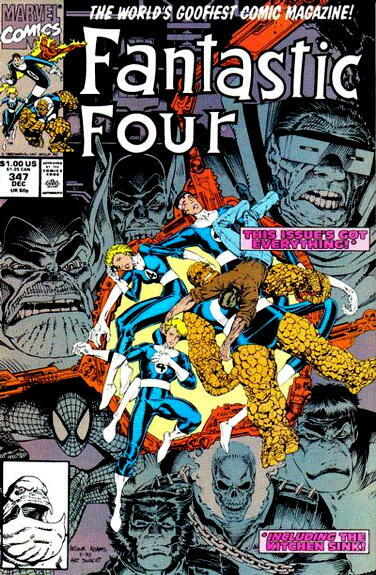 Some of my friends were disappointed that the real FF didn’t stay dead and allow these guest-stars to keep the book longer. Also, if I remember right, the Punisher’s appearance is about three panels at the end of the third issue. These were the very first comic books I ever purchased. I got them as back issues from Ralph’s, after buying the Marvel Universe trading cards, one of which featured this storyline and got me curious. Samuel L. Jackson from Hateful 8 or some other character alltogether? I remember being slightly annoyed at this storyline appearing during the highly enjoyable Walt Simonson run at the time. While I did find this fill-in fun, I wanted to get back to the FF proper. I wonder if this story was (at least part of) the inspiration for New Avengers. Or if this FF arc and New Avengers were just two separate versions of the same “let’s put all of our most popular characters in a book they’ve never appeared in!” mentality. I also wonder if New Avengers marks the time when guest appearances by Wolverine and Spider-man became less appealing to collectors. Also, I know drawing Spider-man like that makes him look more like a human spider, but I always just worry about his pelvis. How is it still attached to his spine? @Thom-I am reasonably certain that the difference here was that Simonson was sending up the practice of characters who were red hot making guest starring appearances all over the place, which was already up and running even then, while New Avengers was an attempt to do what Morrison did with the JLA, only bigger and more cynical. Especially given that the FF story seemed to be done very quickly, almost off the cuff-I had no idea it was coming, and was puzzled that it happened-while New Avengers was in the works for months and hyped to the nines. 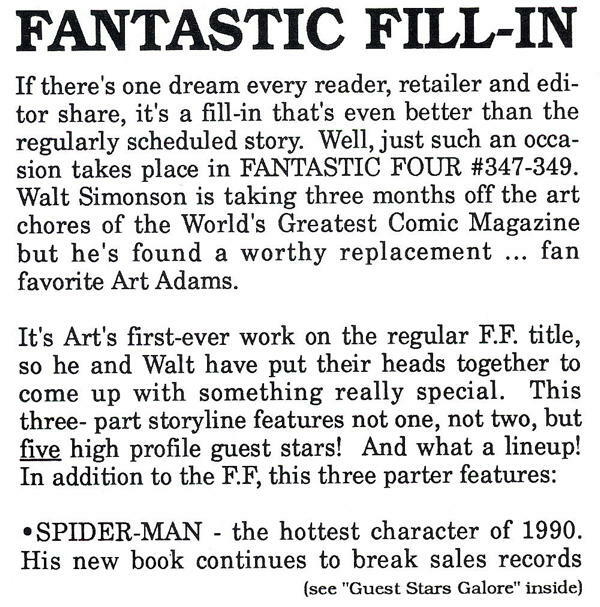 I mean, yeah, I’m sure that part of Simonson’s calculation for the story included “and it’ll sell like CRAZY”, but New Avengers was a far more cynical exercise.